Elvis was a man noted for his sandwich ingenuity -- his namesake is a peanut butter sandwich with bananas and bacon. So, when confronted with the predicament of a (lame) unfrosted peanut butter Pop-Tart, would he be content to leave it as is? Well, DudeFoods is still in the building, and decided to take that exact situation to the next level. With BACON. Uh-huh. 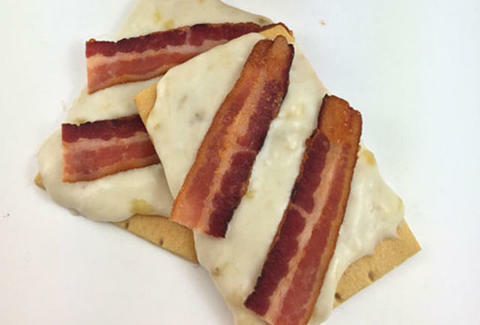 Culinary hero Nick Chipman whipped up a banana frosting using bananas, butter, powdered sugar, and vanilla and added it on top of the Pop-Tarts, and then -- because nowhere in America is that considered sufficient -- topped it all off with two slices of bacon. It's good to be King. Adam Lapetina is a Food/Drink staff writer for Thrillist, and thinks unfrosted things are abominations. Read his musings at @adamlapetina.